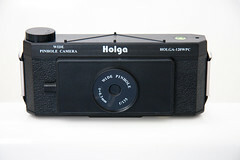 The Holga is a plastic camera for 120 film, whose design originated in Hong Kong in 1981. While many countries produced basic 120 snapshot cameras in the decades before this, the Holga's low-tech approachability and artfully-flawed optics have elevated it to a particular cult status today. Universal Electronics, Ltd. of Hong Kong was started by Lee Ting-mo, a former employee of Yashicas Hong Kong factory. The company started in Kwun Tong, Hong Kong and was originally intended to produce electronic components like capacitors. In 1969 it had a established a successful business manufacturing electronic flash units. The Holga was created as a new product line for the company when basic electronic flash units became very common and inexpensive due to Konica popularizing them for the Konica C35 EF. 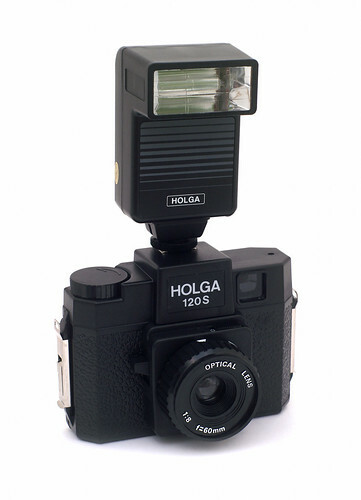 The origin of the name Holga is related to the flash strobes. The early WOC (Wing On Cheung) flash units had the Chinese characters "very bright" which is pronounced as Holgon in Cantonese. Anticipating increasing demand for cameras in mainland China, T. M. Lee set about designing a simple, rugged camera for 120 film which could be sold at an at affordable price. The original camera had only one shutter speed; scale focusing guided by four pictograms; and an aperture switch for sunny versus cloudy conditions (but see below, under "Flaws"). As with another cost-reduction exercise, the Lomo LC-A, the Holga's inexpensive plastic lens gave its photographs quite a distinctive visual signature—including vignetting and pincushion distortion. To reduce these faults, the camera was supplied with a snap-in mask cropping the frame to 6x4.5 cm portrait orientation (although the viewfinder image is square). The Holga was originally manufactured in Hung Hom, Hong Kong but later in 1990 moved production to mainland China in Changping, Guangdong. Well before the Holga existed, a number of fine-art photographers had begun using low-quality cameras for their visual qualities—most notably Nancy Rexroth's Diana photos from the mid-1970s.. But by the time of the Holga's introduction, original Diana cameras had been out of production for a decade; and the Holga gradually emerged as a leading camera for those aligned with a "lo-fi," toy camera aesthetic. The optical flaws revealed by shooting a full 6x6 Holga image became a desired effect for many photographers, who removed the 6×4.5 film gate to yield an image with indistinct, dark edges. While today many associate the Holga with the Lomography brand, the camera had already been on sale for a decade before the creation of the Lomography Society. 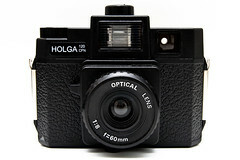 However LSI is a significant global distributor for Holga cameras today. 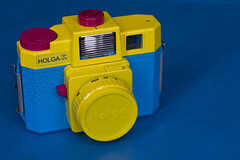 In 2002, freestyle became exclusive Holga distributor in the United States. In November 2015, Holga camera manufacturing has ceased and the tooling has been discarded. As of 2016, a company called Sunrise is currently manufacturing the Holga 120N. Lee Ting-mo kept the Holga 120N tooling. The plastic of the Holga body itself is reasonably sturdy, and the light-trap around the back itself is molded accurately. Light leaks in a Holga usually originate from the red window, the two holes above the film gate, unwanted detachment of the back, or when removing a loosely-wound finished roll. Although it has become less important with later production models, the low-tech (and flawed) nature of the Holga has inspired an active modding community. Users may reduce interior reflections with matte black spray paint, or add Velcro straps to affix the back more securely. Removal of the front lens assembly is not difficult, making it possible to add a filter gel to the "sunny" position or decrease the minimum-focusing distance. Others Holgas have been modified to include cable releases, tripod mounts (lacking on the original 120S), and even to shoot 35mm film. Holgamods.com explains the common modifications and what they do. Cable release, which which slips onto the lens so that a cable release can depress the shutter. Also includes tripod mount since the Holga 120N's mount is covered by the accessory. 35mm Film Adapter, available in two models: full negative and "panoramic." Both adapters come with a light-proof back and a mask made to hold the 135 cannister in place. The only difference between the two models is the size of the mask. The "panoramic" adapter will mask out the sprocket holes. A rarer model available in Japan is an all-in-one back and cartridge unit. Fisheye lens, produces circular Fisheye images. Polaroid CB80 back for Holga for Polaroid peel-apart films. Original model Type 80 films only, newer models will take 600 series films. Also known as Polgasun in Japan. Filter holder and filters. Filter holders can hold one or two filters, depending on the model of the holder. Filters come in special effect filters, color filters, and center spot filters (which leaves a normal center, but a coloured surrounding). Holgon Flash, a small normal flash for Holgas with a hot shoe. Holgon Strobe Flash, a bulky flash which features multi flash strobe (which keeps flashing as long as the shutter stays open in bulb mode) or single flash (a more powerful flash, which will flash once on pressing the shutter and a second time on release). Features vertical adjustable angles. Holgon Slave Flash, a small, round slave flash meant for placing on a surface or handheld. Good for any kind of secondary light. Some units will come with multi coloured filters to place over the flash. Camera bags, available in a small and a large size. Will fit the Holga, a Polaroid back, and some accessories. Holga Enlargers, an inexpensive darkroom enlarger with two available lenses and several masks/negative carriers for both 120 and 35mm formats. Recently, Holgas have become available in a kit form which acknowledges and even celebrates their low-tech nature. The kit includes a manual that details the camera's idiosyncrasies, as well as a roll of black tape for taping up light leaks, though the manual notes that many Holga devotees regard light leaks as part of the camera's signature style. Holgas are also now available in special edition colours for some models, including White, Silver (which adds silver accents to some areas of the Holga), and Gold. These special edition colours normally sell for $40-$50. Holga 120SF (2000) - A standard Holga 120S, with a flash. 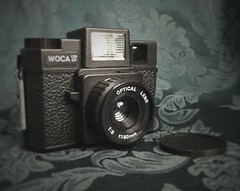 Woca 120G - Woca is a Holga with a glass lens. Woca 120GF - A glass-lens Woca with a flash. Holga 120N - New default model featuring a tripod mount, bulb mode, and a factory 6x6 mask. Holga 120GN - A Holga 120N with a glass lens. Holga 120FN - A Holga 120N with a flash. Holga 120GFN - A Holga 120FN with a glass lens. Holga 120GCFN - A Holga 120FN with a glass lens and a colour flash. 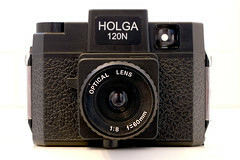 Holga 120WPC - A wide angle pinhole camera. Holga-120Pan - A panorama 6x12 camera. 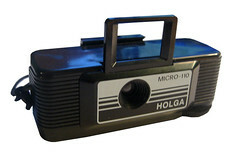 Holga 120 3D - A stereo camera with two lenses. Holga 120PC - A pinhole camera. Holga 120PC-3D - A stereo pinhole camera with two pinholes. The basic plastic 60mm f/8 Holga lens for mounting on other cameras. ↑ An example is seen this image in the Camerawiki Flickr stream. This page was last edited on 14 January 2019, at 22:49.